A magnifier (i.e. magnifying lens) is a lens or combination of lenses used to magnify (or enlarge) an object. Magnifiers and magnifying glasses enable people to magnify a variety of objects (e.g. books, newspapers, fine print, stamps, coins, antiques, art, jewelry, gemstones, foliage, insects, and rocks). The magnifying glass was invented in 1250 by Roger Bacon. Today, over 750 years later, magnifiers and magnifying glasses are more popular than ever, assisting people with hobbies and crafts and also helping people with low vision, macular degeneration or other vision conditions to see better. When it comes to magnifiers, most people probably think of the classic hand-held magnifying glass used by Sherlock Holmes. However magnifiers come in a wide variety of shapes, sizes and magnifications. At Blaxall Optics Vision, we stock over 250 different magnifiers! In addition to Hand-Held Magnifiers, we also carry Hands-Free Magnifiers, Lighted Magnifiers, Page, Bar & Dome Magnifiers, Loupes, Linen Testers & Stand Magnifiers, Pocket Magnifiers, Reading, Specialty Glasses & Monoculars, Magnifying Mirrors, Portable Microscopes, Opera Glasses & Binoculars, Each of the magnifiers in these categories meets different magnification needs. In order to select the best type of magnifier to meet your individual magnification needs, please consider the following information. First, we need to discuss and understand three main points -- lens size, magnification, and focal length -- on how magnifiers work. Lens Size The lens size is the optical area of the lens, generally measured in diameters for round lenses or in length and width for rectangular or square lenses. The lens size is a very important component of a magnifier because the lens size needs to be large enough or small enough to use the magnifier effectively. (Some people want the largest lens size possible to see as much of a subject as possible. Other people want a small lens size to enable them to keep the magnifier in their pocket, purse or handbag.) In any case, purchase the magnifier to meet your particular needs. Magnification Magnification is the process of enlarging an object in visual size, normally through an optical lens. It is the ratio between the apparent size and the true size of the viewed object behind the lens. 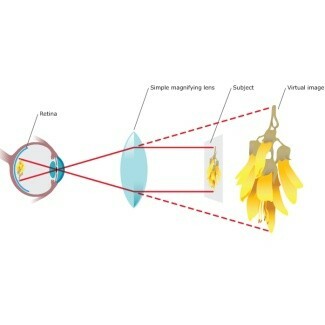 If an object behind the lens appears ten times larger than its true size, and the object is in focus (i.e. at the proper focal length), the magnification is 10x. Another term used as a measurement of optical power, but different from magnification is diopter. Diopter refers to the optical power (or strength) of the magnifying lens. It is the strength of the magnifying lens measured at one meter. Four diopters (4.0D) represent a 100% increase in magnification or 1x power magnification. A 20 diopter (20.0D) measurement is approximately equal to 5x power magnification. A rough formula to convert from magnification power to diopters is to multiply the magnification power by four. Focal Length Focal length is the distance from the magnifying lens to the object behind the lens when the object is in focus. The stronger the optical power of the magnifying lens, the shorter the required distance between the magnifier and the object behind the lens. If you are observing jewelry through a 10x loupe, both the gem and your eye need to be very close to the loupe. However, if you are able to read a book with a 2x hand-held magnifier, the magnifier can be several inches away from the book and your eyes can be several inches away from the 2x hand-held magnifier. Relationship of Lens Size to Magnification Please keep in mind, as the lens size (diameter) of the magnifier lens increases, the magnification power of the magnifier decreases. As the lens size of the magnifier lens decreases, the magnification power of the magnifier increases. This is a result of the amount of curvature in the magnifier (lens). Magnification power is a result of the amount of curvature in the magnifier lens. As the lens size increases, the amount of curvature in the lens decreases, resulting in lower magnification power of the lens. As the lens size decreases, the amount of curvature in the lens increases, resulting in higher magnification power of the lens. This is why higher magnification lenses are generally smaller in size than lower magnification lenses. Field of View The end result of magnification is to provide you with a magnified “field of view.” The field of view is the area of magnification you see through the lens. Generally, the larger the diameter (or lens area for rectangular or square lenses) of the lens the larger the field of view of the lens. However, not all magnifiers are the same and some have larger fields of view than others. Not all manufacturers identify the field of view as a specification of the magnifier. Types of Lenses Along with understanding the lens size, magnification and focal length, it is important to purchase the appropriate type of material or composition of the optical lens to meet your needs. Magnifier and magnifying glass optical lenses can be made of glass or acrylic (plastic) materials. Each type of lens has advantages and disadvantages when compared to the other. Generally, glass lenses allow more light to be transmitted through the lens and usually have very clear optical qualities. It is hard, but not impossible, to scratch a glass lens. A glass lens is generally heavier than an acrylic lens of the same size. NB: As you increase the magnification the lens size effectively decreases. It is not possible to get a high power lens in a large diameter. Opticical combinations are a compromise for the “ideal” magnifier.